$2.80 is the minimum 1944 quarter value. It is the underlining price of silver moving your coin to this level. The Philadelphia mint did not use a mintmark, issued the highest total amount of quarters in 1944, and are today the most commonly found. 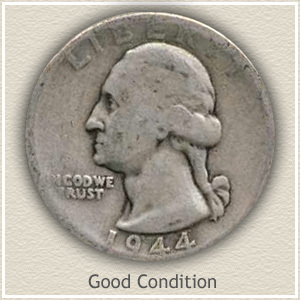 To reach higher values your coin must be in nice "Uncirculated" condition and exhibit great detail. The 1944 quarter pictured is an outstanding example. In this condition it is worth considerably more than the minimum silver value. 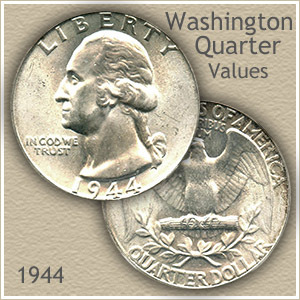 In today's market, the circulated 1944 quarter is worth silver bullion value. The "1944-D" listing on the coin value chart indicates a coin minted in Denver in 1944. Locate the "D" on the reverse of the quarter, below the eagle. Additionally, the pricing data covers different conditions, how to identify them and "Grade" your coins is covered in detail next. 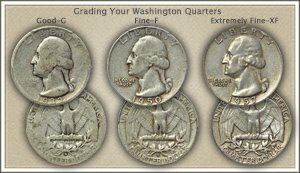 The grading images are lined up to show the different stages of wear on a Washington quarter. Spanning from the "Uncirculated" grade down to the "Good" grade. The descriptions define the "Grade" and highlight the subtle details to consider. Hopefully this reveals a higher grade and your 1944 quarter value is well above the minimum. 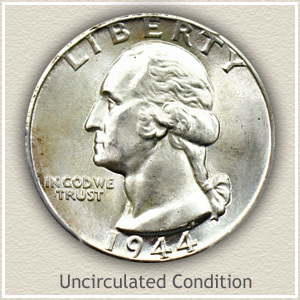 Uncirculated: A quarter in this grade has never circulated through commerce and survives today untouched. Showing no signs of wear, it still has the look of brand new. The most desirable condition to collectors and the highest values. 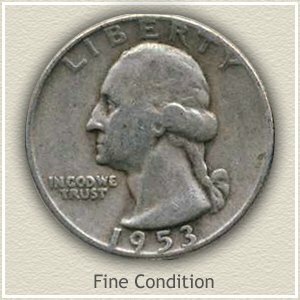 Extremely Fine: This quarter exhibits minor evidence of circulation, but was put away before to much wear resulted. Examine the hair and you notice the details are gone. Also the roundness of Washington's neck and cheeks has smoothed out somewhat. Fine: Most of the small detail in the hair is worn smooth, the detail around the ear is missing, but the major design elements are still bold. True the coin has a circulated appearance, but not tired. Overall a pleasing coin. Good: The Washington portrait is smooth from circulation, but all essential details remain. The rims of a 1944 quarter are normally still well defined, but have begun to merge into the lettering and date. Including more relating to your 1944 quarter value. Easily find how much your old coins are worth. 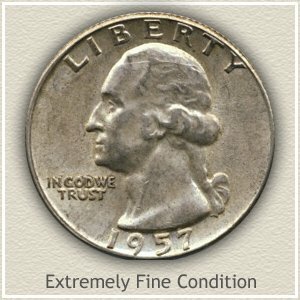 Just in time for the holidays, Heritage Auction Galleries sold one of the finest 1944-D Washington quarters for $517.50. Quality throughout, this quarter was noticeably well struck with all details brought up sharply. Featuring clean surfaces undisturbed by any evidence of marks or abrasions. Your eyes are drawn to the bright color of deep, yellow-red toning surrounding the obverse portrait. The high auction price proving quality and rarity has a loyal following of collectors. A perfect addition to any collection in any season. Research the web, it is an excellent tool to investigate auction and dealer inventories. Your coin compared to the offerings quickly gives you a feeling for how much your 1944 quarter is worth.